The only bad thing about the NT15C1 is the price. That said, you're getting an awful lot for your money, and when was the last time you could say that about a train? Improved styling, build quality and features. Tones sound more focussed. Price is a little on the steep side for a 15-watt 1x12 combo. One of the oldest amp brands in the world, Vox has had its share of ups and downs. However, the past 20 years under parent company Korg have seen massive investment in R&D, and as a result, some pretty stonking amps - in particular, the Night Train range. 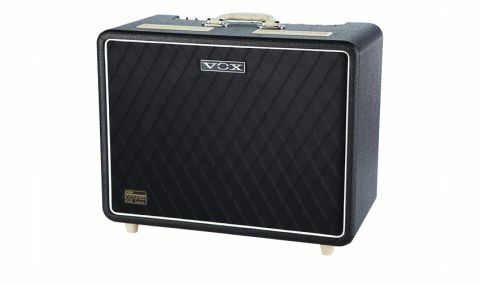 For 2013, Vox has relaunched the Night Trains from a factory in China, including this 15-watt combo. "Like its predecessor, the NT15C1 is powered by a pair of EL84 output valves, but elsewhere, there are some major differences"
Like its predecessor, the NT15C1 is powered by a pair of EL84 output valves, but elsewhere, there are some major differences. The new version looks slicker with much improved styling, while under the hood, the electronics are a step up from the already excellent build quality. Vox does styling really well, and the NT15C1 has some neat touches, like the monogrammed handle and the mini chickenhead knobs. The control panel now gives you access to two channels called Bright and Girth; the former provides classic Vox clean sounds, while Girth is more about classic rock and modern overdrive. The Thick switch boosts the NT15's Bright channel by bypassing the tone controls, while another called Dark adds a dose of extra bass. Combined with the Girth channel, the NT15 is ideal for metallers and seven-string slingers who like to hang low. Further down the list of improvements is an effects loop and digital reverb, making the NT15C1 a more complete article than its predecessor. But what counts are the sounds, and happily, the Vox has plenty of seriously good ones. Set the gain and volume controls for just a hint of overdrive on the Bright channel when you hit the strings hard, and the NT15 rewards with inspiring classic clean tones, nailing the complex treble jangle that typifies the early Vox sound. Hit the Thick switch and you're in classic-rock central, with bags of natural compression and dynamics that effortlessly respond to your playing, making crunchy powerchords and singing leads almost too easy. Swap to the Girth channel, hit that dark toggle and detune a tone or two for an altogether more menacing vibe, closer in feel to a US metal sound. Everything sounds a lot more focused and together than the original NT15, and for a relatively small amp, the new Night Train is also mighty loud, thanks to the very efficient Celestion G12M driver, which sounds awesome. You can take your pick when it comes to suitable guitars, too; the Night Train doesn't discriminate against single coils or humbuckers - although the latter really sets the higher- gain sounds on fire.